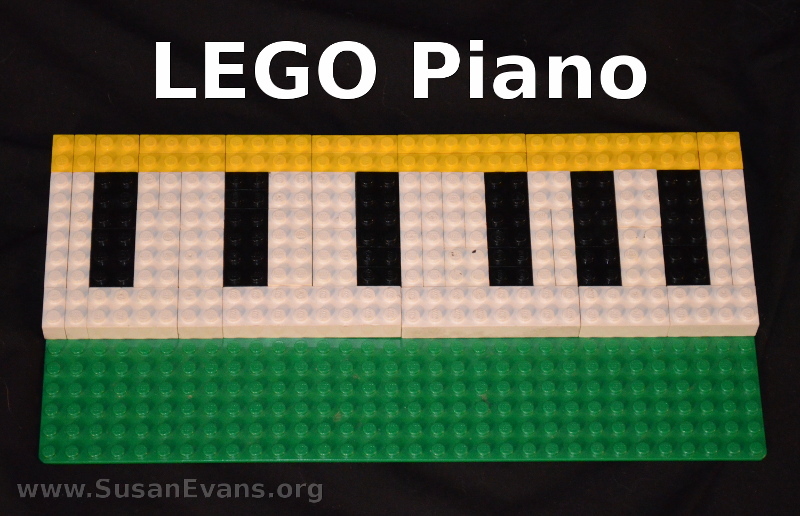 Make sheet music with LEGOs and have your kids play the musical notes or to identify what each note is on the scale. 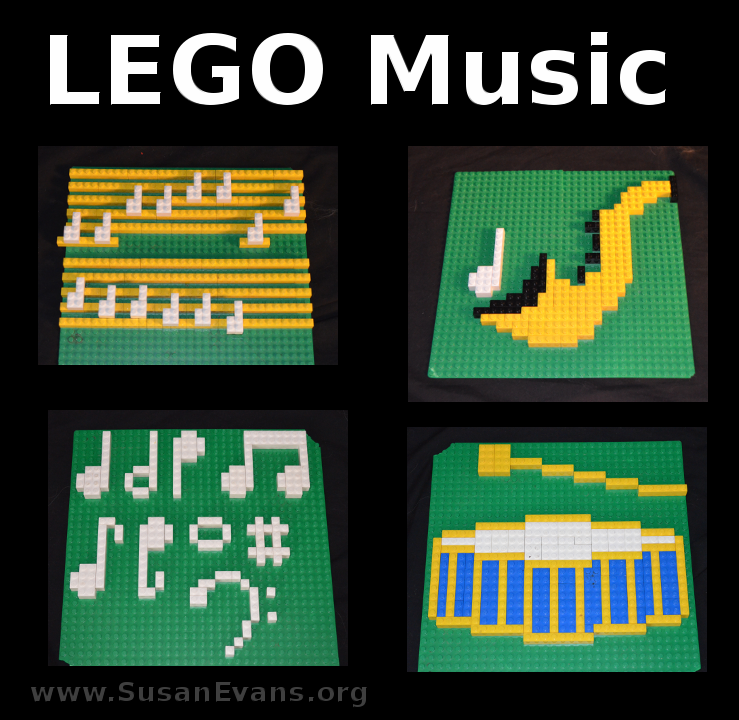 Make the shapes of different musical notations using white LEGOs on a green LEGO base. Identify each shape. Design different instruments on LEGO bases. Pictured above is a saxophone and a drum. As you can see, the curved edges are possible by tapering the LEGOs. You can also use colors like black for shadows, as well as for the keys on the saxophone. You can decorate the drum by creating stripes of different colors. When creating a LEGO guitar, you will need two LEGO bases. The bottom part of the guitar will be on one base, and the top part on the second base. 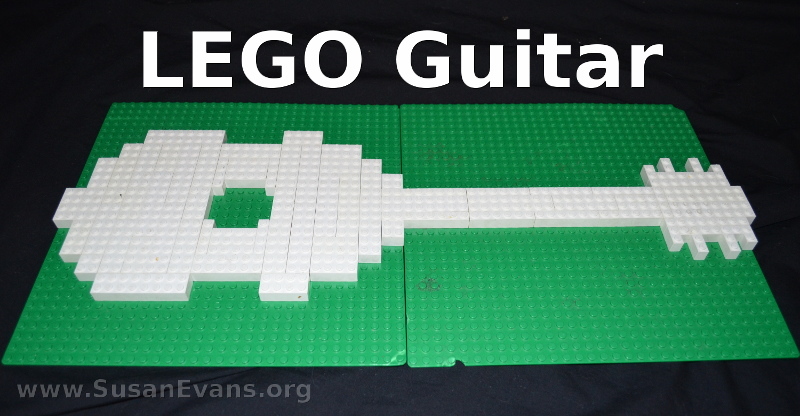 You can use white LEGOs and look at the shape of a guitar from a picture. You can also create a LEGO piano by using black and white LEGOs. My son attached the keyboard to a yellow strip that represents the wooden part of the piano. 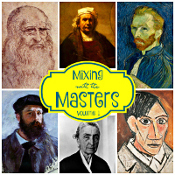 Don’t you love how all the LEGO music creations turned out? 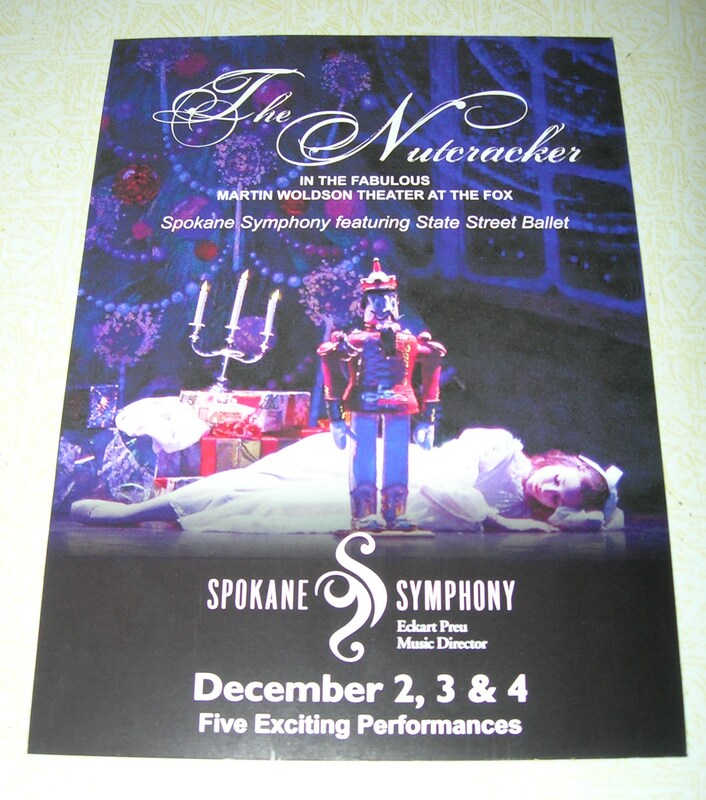 This year my husband and I took our children to see “The Nutcracker” for the first time. The children were familiar with Tchaikovsky, having listened to his music since they were infants. The dancing, twirling ballerinas were mesmerizing for the children to watch. When we arrived at the theater, we walked far up the balcony and off to the side. That’s what I get for booking the tickets two days before the show. On the website, you could check a box that said you were willing to have an obstructed view. Ummmm… really? Right, that’s what I want when I go to the theater, to have an obstructed view. Why do they even make seats with an obstructed view?? Before sitting down in the theater, I tried to see where the seats with the “obstructed view” were, and my husband said that you had to look through plexiglass at the show. My musical son had such a beautiful expression on his face as he watched the show. A lovely, tranquil smile could be seen through the glow of the theatrical lights. I could have sat there staring at my son’s expression the whole night. When the Nutcracker danced with the girl, it was lovely. I prefer dancing between a man and a woman rather than lots of women in stiff tutus. I leaned over to my husband and said, “You probably just see this whole thing as girls dancing around in tutus.” “Pretty much,” he said, laughing. I’m trying to decide whether my 10-year-old son should take piano lessons or not. Let me start by saying that when I was a young teenager, my parents forced me to take piano lessons for two years. Two years of misery. Two years of doing something I was not good at, over and over again, willing my fingers to hit the right notes but failing. Pounding the notes louder and louder ’til I got in trouble. I hated those two years of mandatory music lessons. I’ve never played the piano since. Why would I? I was never any good at it. But did I learn anything from it? Perhaps perseverance. But that can be learned in other ways. Did I learn how to harmonize? Yes. But maybe I learned that in the boarding school choir. Did I learn to read notes in case it was an emergency and I needed to play the piano? Sort of. Not really. And what exactly is an emergency? 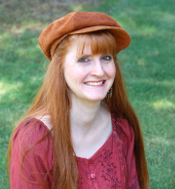 Ever since I was a teenager, I wanted to be a missionary, and I envisioned myself in some rural village, married to a preacher who needed me to play the piano. But in what fantasy world would there be a piano in the middle of a poor rural village? And why couldn’t we sing a cappella? Voices with no instruments sound beautiful to me, more worshipful. So would I ever be in a situation where it was mandatory to play an instrument? Now that I have entered middle age, I can confidently say no. The vast majority of the population never takes instrument lessons, and they’re not less smart. I don’t know why we as homeschool parents feel that if every single student of ours doesn’t take instrument lessons, they will end up being worse for it. What if they ended up using that same amount of time doing something they were good at, that would allow them to earn a scholarship to college? Or maybe they would just have a nicer life, not having something they despised in it. Years ago when my oldest son was only six years old, I found a book that promised to teach you to play the piano in one afternoon. I used that to teach my children piano lessons. I had a small toy piano that was wooden. I got some cardboard and glued black felt to it. With chalk, I marked the music bars. I sprayed it with hair spray to keep it in place. Then I nailed it to the wall above the tiny piano. I made cream-colored felt notes, and I would place them in different places and ask my children which note it was. They learned to read notes. They learned the major chords. It took one month. I hated teaching it. It was the first time I hated teaching my kids. It was because my oldest son would throw a fit because he didn’t get the notes right the first time. He would scream and be frustrated and hit the piano. I was exhausted. Yes, I see this situation as poetic irony, but I’ll move on. My second son was only five years old, but he played the notes confidently the first time, with no instruction. 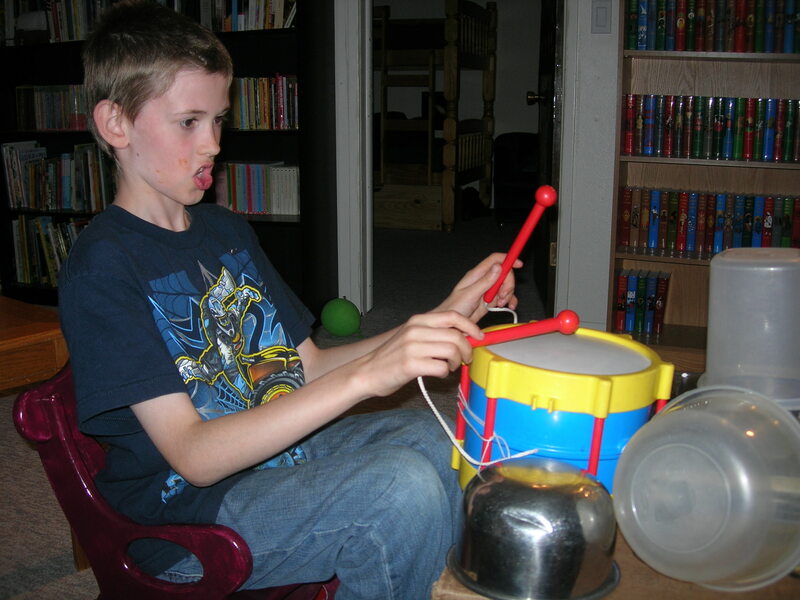 It was such a joy to teach him music. My third son was three. He played the notes over and over until he got them right. He never got frustrated. 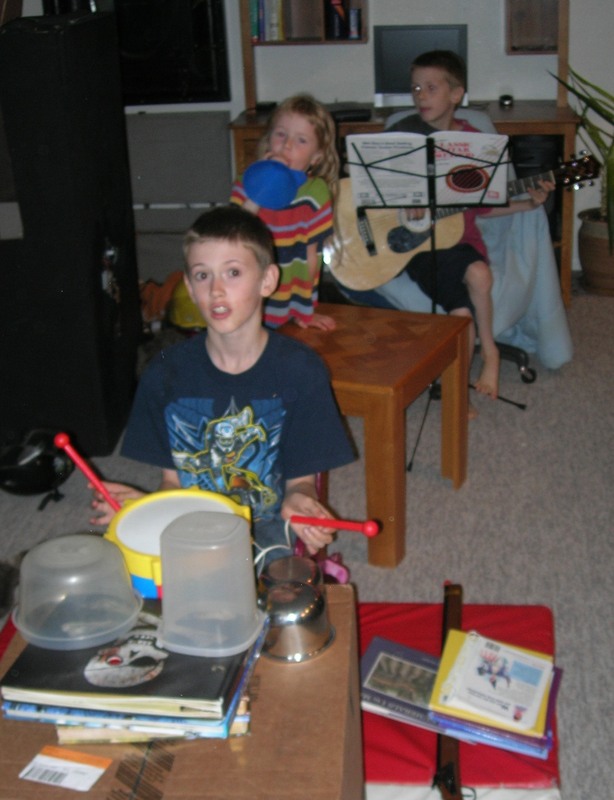 My second son, who was a natural, always had an affinity to playing the guitar. He would intently watch the worship leader’s fingers as he played the guitar. Finally after praying about it for years, we finally had enough money to buy him a guitar when he turned eight. We’ve paid for music lessons, and they’ve been worth it. He’s advancing quickly. He can tell if his guitar is out of tune. (I can’t.) He’s a natural. I don’t mind throwing my money at something that God obviously gave him as a gift. Okay, now comes the story of my oldest son. His mind is incredible. He’s going to be a mechanical engineer. He is an artist, too. He has a mathematical mind. He likes talking philosophically. But at church he sings loudly, completely off key. He has no pitch, and you remember how those simple piano lessons were like pulling teeth. I hesitate to give this boy piano lessons. Money is tight. Why waste the money and produce misery? Another thing to keep in mind is that I prayed years ago that whenever God wanted me to pay for piano lessons for my oldest son, that God would give us a piano for free. Then I would know. I was so confident that this would never happen that I felt relieved that I didn’t have to think about it any more. Until this Christmas, that is. Our in-laws got us an electronic keyboard. I panicked briefly, looked up at God, and asked him if that counted as a piano? I still don’t have my answer. To complicate matters, my oldest son thinks he wants to take piano lessons. I know that learning piano is supposed to be good for your mind, but so are a lot of other activities that might be more productive. Please comment below and tell me your opinion as to what I should do. I just feel that the decision needs to be made now, because when my son is in high school, he will have way more subjects to study, possible apprenticeships, part time jobs, and other interesting things. In my mind, it’s now or never. My husband and I were called to come downstairs to hear the children’s pretend symphony. My son Bryan had overturned some pots and tupperware to create a drum set. My daughter used a funnel as a trumpet. My son Stephen played his guitar. Nathaniel was the conductor. He tapped his chopstick on the bookshelf to get the musicians’ attention. 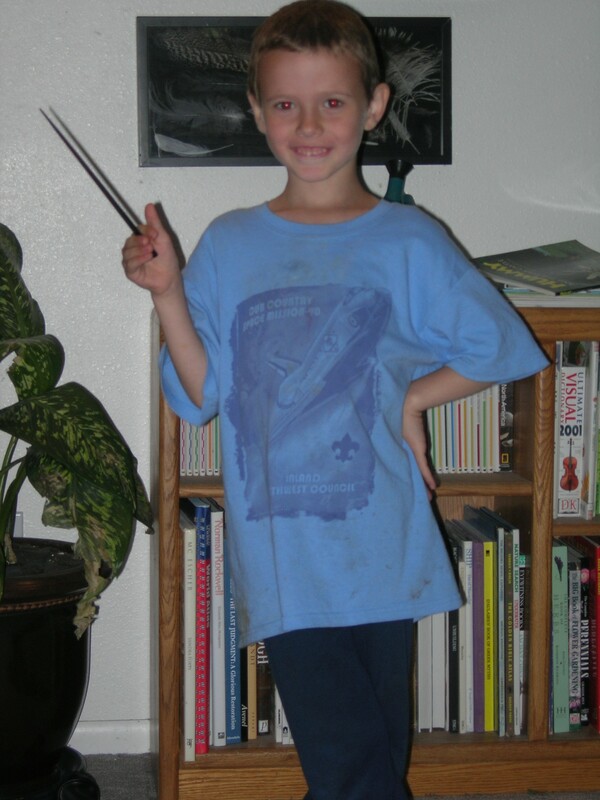 Then he began waving his baton, and a cacophony of sound permeated the air. Whenever the conductor moved his baton quickly, the music sped up; whenever he moved it slowly, it slowed down. My husband had a smile on his face as the show went on. It didn’t sound good, but, boy, were they having a good time. Ah, yes, creativity at its best.